Use the Zip2Go utility to gather and compress the open (current) Mastercam part data into a .Z2G file. That file can then be opened and viewed with most zip/unzip programs. This is especially useful if you are trying to share file information with In-House Solutions’ Technical Support and/or Post Team. 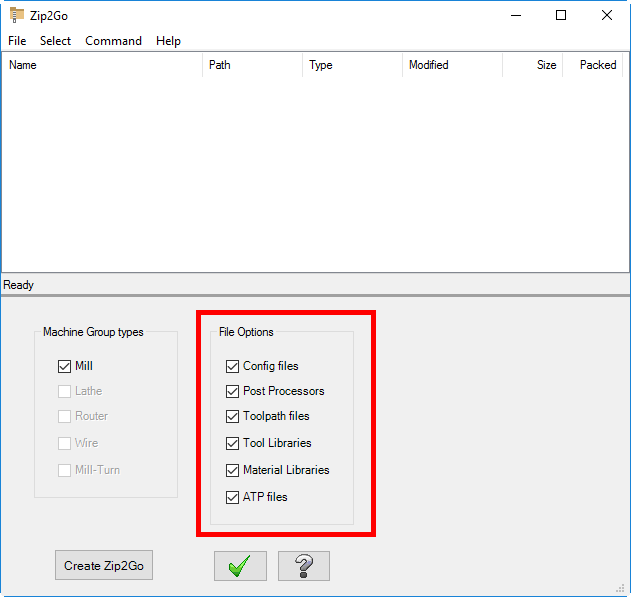 Note: Zip2Go scans the machine groups in your current file and captures certain information such as your Mastercam configuration, machine definition, post files, tool and material libraries, Wire power libraries, ATP files, STL files, and machine group default and operation files. In the main Zip2Go window, select all check boxes. Choose the Create Zip2Go button. Locate the Zip2Go file – attach to email and send to support contact.